One of the three-space extension invasions is at the centre of a fourth line extension. This invasion often occurs in handicap games. The most aggressive answer is one of the a points. The contact play at b will establish a connection underneath and the contact play at c will connect on top of the invading stone. Those connections are good if Black is not strong enough to attack the invasion. 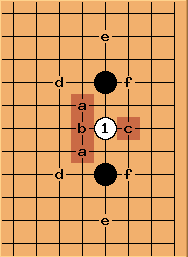 The one-space jump of d is a flexible answer, attacking while defending. Many players make the mistake of playing c with the intention of connecting underneath, leading to the infamous Bermuda Triangle. 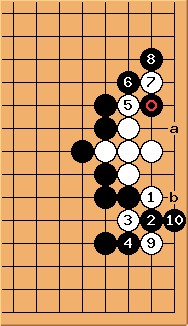 A search in gobase shows that in professional games, the flexible answer at d and the territorial move at f are most often played. f has a follow-up at c, aiming at the connection underneath, without getting into the Bermuda triangle. ...she will live locally while Black builds magnificent outward influence. Knowing this sequence and all its possible variations is usually good enough to reduce the handicap. 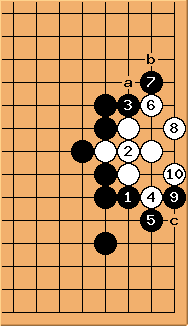 If Black wants to connect underneath, the line of play is to play on top first. The ensuing hane and cuts are all natural. 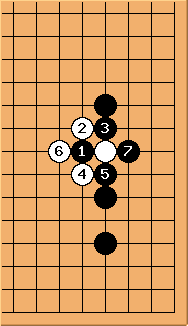 White gets a ponnuki and sente. In general this is regarded as a good result for White because of the influence of the ponnuki. 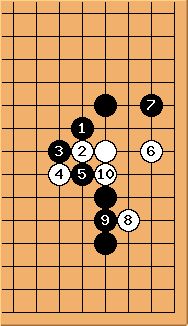 Black's single-mindedness in keeping his territory is usually discouraged, but it takes a skilful player with White to use the ponnuki effectively, especially since it is in atari. Usually, White cannot resist. Players will sometimes try to overawe their weaker opponents with this maneuver so Black must keep confidence and understand the strength of this position. After White's hane Black must cut at and not fall into the Bermuda triangle. After the connection at , White can fill at , leaving the miai extensions to a. Black can then fix up his shape at b. If he doesn't, b becomes an interesting point for White to attack the shape. Charles Actually it is rather slow for White to connect here; especially in a handicap game. Dieter: Thanks Charles. Settling the shape (especially a ko) indeed favours the weaker player. Your hint may improve my winning percentage in high handicap games - oops, did I say that doesn't matter to me #:-7 ? In a high-handicap game, White probably thinks like this. After , White can connect and then up to it is a ko for White to live. White is quite interested in this, for two reasons: there is aji left at a and b, and if White wins the ko at c Black's corner territory can be destroyed. 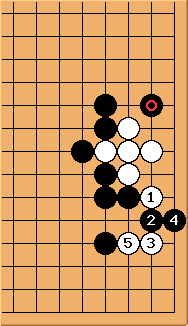 In fact if you look at Black's outside wall, it is full of defects (four cutting points). What about here? It looks quite strong. 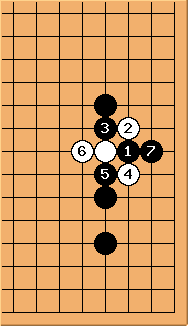 Arieh - Based on the following two lines, is white simply dead if he fills the Ponnuki? 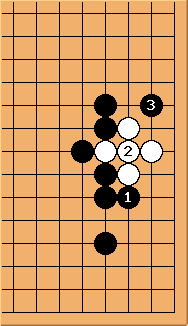 Now White can't quite live: there are kikashi at a and b for White, but that isn't two eyes. 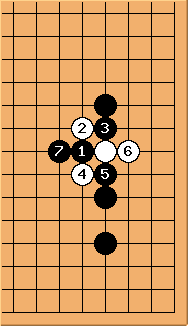 Therefore in this case the aji of and is probably what White tries to use, later in the game. 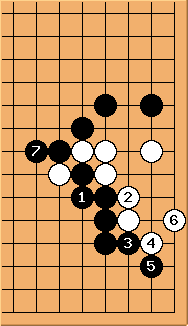 One can say that if White doesn't connect immediately, it makes the game rather complex. Same remark as in 2. Variation.